We’re Your One-Stop Moving & Storage Supply Shop! 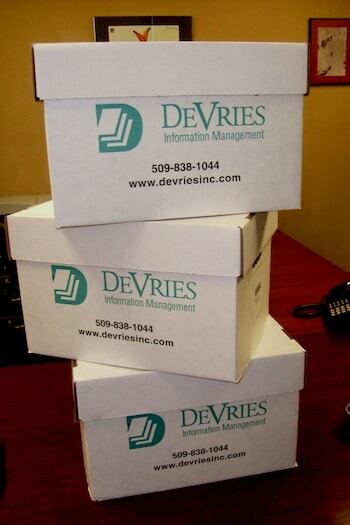 At DeVries, we not only manage your records—we also sell or rent (and deliver!) everything you need to store or move them. Nobody knows better than we do which supplies deliver exceptional value and which equipment actually boosts your efficiency and is worth the investment to purchase or rent. When you’re one of our customers, you’re like family to us, and we believe that part of serving you well is pointing you in the right direction when it comes to moving and storage supplies. We would rather do the work of finding and supplying what you need than make you do the hunting yourself. It’s easier and far more convenient for you, and it helps us make sure you have quality supplies—the RIGHT stuff, not the RIP-OFFS. Our storage boxes feature medium-duty construction that’s sturdy enough to use for moderate stacking in rooms with or without shelving units. Internal box dimensions are 10.25”H x 12”W x 15.25” D.
Our per-box price starts at $2.20, which is better than any retail outlet, and volume discounts are available. We also deliver orders of $25.00 or more for FREE! Don’t buy from over-priced office supply retailers until you request a quote from us first! Because they’re a great way to move your office, we also rent E-Crates, Computer IT Crates and E-Crate dollies to our customers. Our crates have many advanced features that make them easier to use, more stable and more secure than other options. Our crates are adaptable to letter- or legal-sized documents, come pre-assembled and ready-to-use with no instructions needed, and protect your records better than even heavy-duty cardboard. We’ll even rent you a deluxe custom E-Crate dolly if you need one! When you need the highest-quality moving and storage supplies at reasonable prices, please contact us and request a free quote before over-paying elsewhere! Volume discounts are available.